Rangers’ dreams of reaching the Europa League last 32 were extinguished as they failed to get the victory they needed edge out Rapid Vienna. Victory in the Austrian capital would have extended the Ibrox side’s remarkable run beyond Christmas. But there was no fairy-tale ending for the team Steven Gerrard put together back in the summer as Dejan Ljubicic’s late winner sealed a 1-0 win at the Allianz Stadion as the hosts joined Villarreal in qualifying from Group G.
A campaign that started in the second week of July and involved four qualifiers had pushed Gerrard’s squad to the limits. 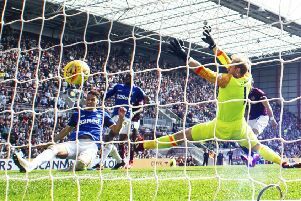 They were without three key men - the injured Ryan Kent, suspended Daniel Candeias and ‘unsettled’ Ovie Ejaria - and a lack of cutting edge in the final third was their undoing against Dietmar Kuhbauer’s ordinary Rapid outfit. They did have one big chance midway through the opening half when Connor Goldson’s header hit the crossbar but more was needed to stop the Green-Whites securing their slot in Monday’s draw for the round of 32. Rangers had an official ticket allocation of 2,500 but there were pockets of the Light Blues faithful visible around Rapid’s packed-out ground, while thousands more were stationed in Vienna city centre eager just to be in close proximity of their heroes’ date with destiny. Gerrard’s team looked slightly hesitant from the kick-off, knowing a repeat of the sloppy starts they made in their last two games against Aberdeen and Dundee would leave their qualification hopes hanging by a thread. But once they shook off the nerves it was the visitors who warmed up quickest on a bitterly cold night in the Austrian capital. A tame Borna Barisic free-kick was easily gathered by Richard Strebinger on the quarter-hour mark but it was only the woodwork which kept them out seven minutes later. Boli Bolingoli’s handball on the edge of his box gave Rangers a free-kick chance wide on the right. Gerrard was convinced the Belgian defender was inside the area when he used both arms to stop James Tavernier’s cross but Italian referee Paolo Mazzoleni called it right when he gave the award outside. Tavernier’s set-piece delivery was on the money for Goldson but his header thudded back off the bar. That was pretty much it for first-half chances as Rangers failed to take the extra bit of care with their final ball that was necessary on the squishy surface. Rapid were happy with the stalemate so the onus was on Rangers to role the dice in search of the breakthrough. Lassana Coulibaly tried his luck with a lob but watched it sail over but it was increasingly the home side who were looking the happier as the minutes ticked away. Gerrard made his move with 19 minutes left as he introduced Eros Grezda for Coulibaly before swapping Kyle Lafferty for Ryan Jack shortly afterwards. Tavernier stung Strebinger’s fingers from the edge of the box but Alfredo Morelos was too late to pounce on the rebound. And Rangers’ hopes were finally killed off six minutes from time as Ljubicic sealed Rapid’s place in the knockout stages. Allan McGregor fired a kick-out straight to Venton Berisha who fed the ball to the substitute. He played a one-two around Gareth McAuley with Christoph Knasmullner before poking the ball into the corner of the net to leave Gers deflated.